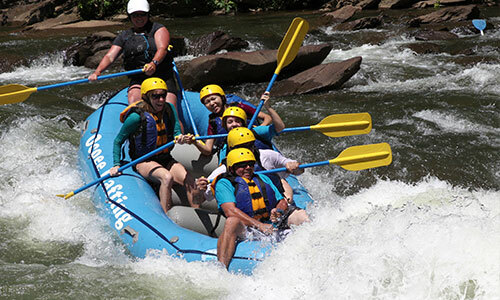 *With Adult: An adult (18+) must accompany children on course. Regular adult fee applies. 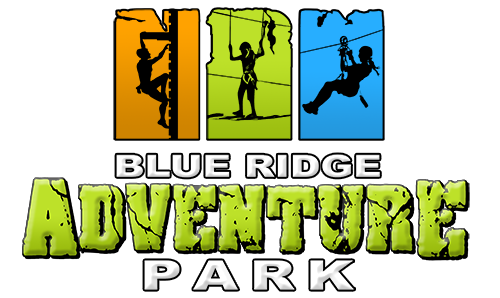 Blue Ridge Aerial Adventure Park has three levels of challenging obstacles. The aerial courses vary in difficulty, ranging from the first level at moderate difficulty to the third level at a high level of difficulty. The network of obstacles increase in difficulty as you move through the courses, requiring more balance, upper-body strength and focus. Since there’s no “right” way to complete the obstacles, it’s up to you to navigate the route from platform to platform. As you move through the park, you’ll be clipped in to a safety line at all times. The third level requires an adult to accompany any participant under the age of 15. 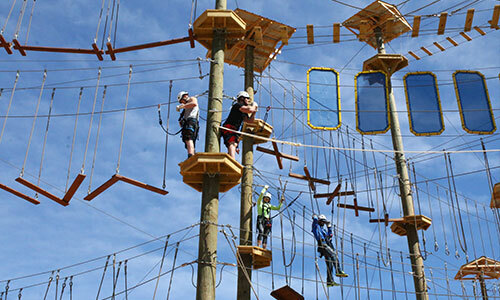 The Green Course offers 10 obstacles and a 125-foot zip while 15 feet in the air. This is the easiest course (not including the Youth Level), and where many begin their journey. But, don’t let that fool you, because it's still a challenge. 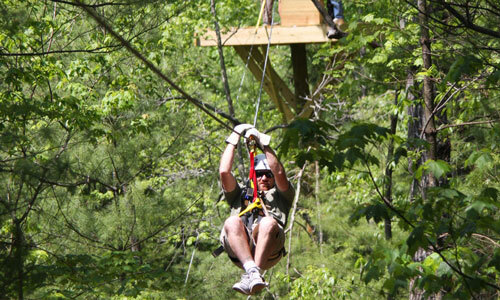 You will walk a tight rope, hold your breath over a suspended bridge, and jump from one swinging log to another. Must be 8 or older and able to reach at least 70 inches high to participate. 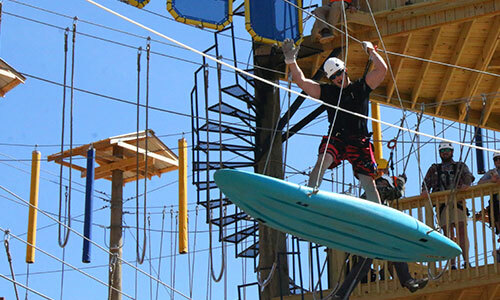 The Blue Course offers 11 obstacles and a 125-foot zip while 30 feet in the air. This course requires some balance as you move over hanging wooden blocks and surf on our “Flying Kayak!” Must be 8 or older and able to reach at least 70 inches high to participate. Additionally, children under 10 years of age require an adult to accompany the child. The Black Course is the hardest of them all! 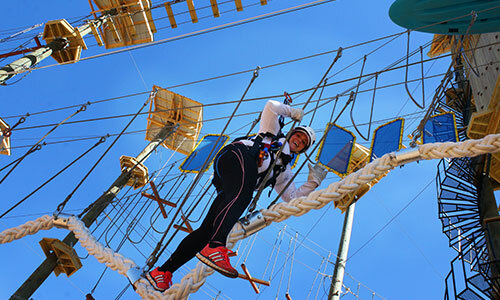 Consisting of 13 obstacles, a 125-foot zip, and a climbing wall, you will be truly challenged while 40+ feet in the air. Must be 10 or older and able to reach at least 70 inches high to participate. Additionally, children under 15 years of age require an adult to accompany the child.